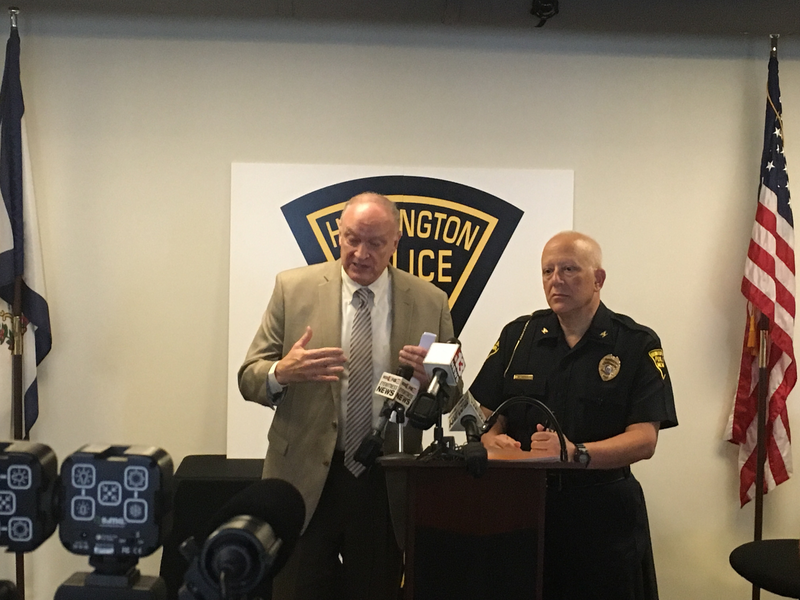 Jim Johnson, Director of Drug Control Policy along with Joe Ciccarelli, Huntington Police Chief speak at press conference. Of the 26 overdoses, 12 doses of naloxone were administered, but one person required as many as three of the doses. The rest were revived using an apparatus called a bag valve mask that helps pump air into the victim’s chest. Huntington Police Chief Joe Ciccarelli said officials aren’t sure what might be different about this batch, but there have been reports in the region of heroin being mixed with fentanyl, a strong pain reliever, or carfentanil, a pain reliever meant for large animals. Ciccarelli said tests are being conducted at the state crime lab to figure out what was in the drug. The 26 overdose victims are all still alive. U.S. Senators from West Virginia and New Hampshire are asking the National Guard to provide more help fighting drug epidemics in their states. Governor Earl Ray Tomblin and Senator Joe Manchin join President Obama at the National Rx Drug Abuse and Heroin Summit in Atlanta, Georgia Tuesday. According to a press release, Obama will announce Administrative actions to further the fight against the drug epidemic. The Administrative actions include expanding access to treatment by releasing $94 million to 271 Community Health Centers to increase substance use disorder treatment services. West Virginia community health centers in Huntington, Weirton, Dawes, Scott Depot and Rock Cave will receive a total of $1.7 million in funding. A Pittsburgh man has been sentenced to 10 years and 10 months in federal prison for operating a heroin trafficking ring. Thirty-one-year-old Christopher T. Gyorko was sentenced Monday in federal court in Wheeling.